Some firsts are big – first date, first kiss, first job, first car, and (of course) first horse. Other firsts are small and personal – not seeming like much to an outside observer, but providing a glowing feeling to the person involved. This week provided several of those very small firsts, marking personal victories and leaving good feelings all around … well, for the humans involved, anyway. First solo ride – This was actually my mother’s first. Unbeknownst to me, she’d been planning this for a while. Thursday, after lungeing Coffee, she decided to get on, solo for the first time since he joined the family. The first I knew of it was a voicemail, informing me that she had just gotten off of her horse! She was very pleased, and very proud – and well she should be! I was pleased, because it means she trusts the little Appy boy I found for her. First ride in months – This was mine. 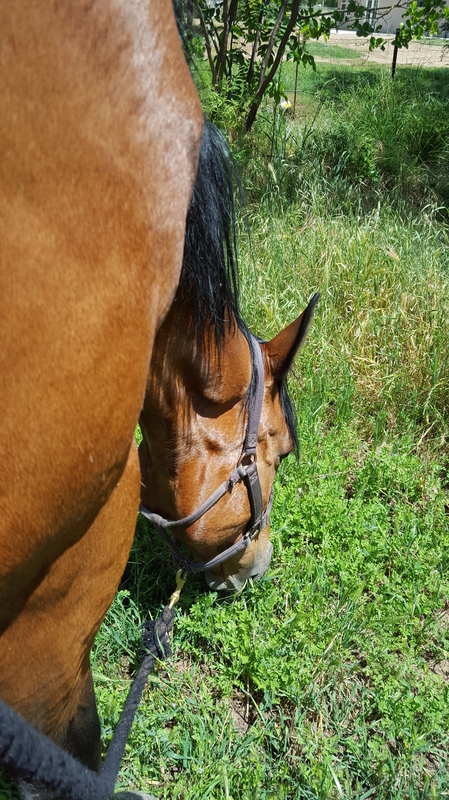 Since my abortive attempt to return to riding last Thanksgiving, after recovering from the accident last summer, I have been focusing on groundwork. Everyone has been getting stronger, including me, so it was time to climb aboard. Coffee was the selected subject, being the most fit at the moment. He wasn’t so sure about me, since my mother has been his only rider for over a year – but he’s a good boy, and we soon got on fine. This was a good sign, since my mom is expecting me to train her boy for her. First ride on the ‘new’ saddle – This was also the first time in the saddle I purchased last winter. It was nice to finally sit on it on something more mobile than a saddle rack! First calm walk up the driveway – On Saturday, Tally showed an interest in going up our driveway. This is normally an anxiety filled experience, but I decided to humor her. Up the driveway we went, in a calm and relaxed walk. All the way up, not a spook or tense moment. Calmly she grazed in the driveway, and calmly we went back. I was thrilled! Sunday we repeated the trip, and this time even watched as a car passed on our road. The ‘other’ Tally would have tried spinning and bolting; but this Tally simply watched alertly, then returned to grazing. True progress! after an enjoyable training session, the sun was warm and Tally calmly grazed. For the first time I trusted her enough – and I leaned against her warm hide completely relaxed. She stood solidly, quietly munching. It felt wonderful! How far she has come! And now, a “second” … WordPress reminded me that this week marked the second anniversary for this blog. When I started this, I had no idea how long I would keep it up, nor how many people would actually read it. I have been pleasantly surprised on both fronts. This blog has provided me with both an outlet for my enjoyment of writing, as well as a place to share the humorous and humbling moments of my journey. I have met many supportive people from around the world, and have greatly enjoyed the interactions. I have enjoyed following many of you on your own journeys, and look forward to where they go next. This journey back to serious and academic riding that I started several years ago is taking far longer than I ever imagined. There have been many set backs and injuries along the way – and times when it seemed clear the only smart move was to give up and get out. Yet, some part of me has been too stubborn to make such a final decision. So, here I am, years later, still not riding regularly, but closer to my horses than ever. They certainly seem happier than ever. Even though I have many doubts about how far I will get toward my goals, I am also somehow happier. On thing is for sure – I’m still horse crazy! This entry was posted in My Journey and tagged Coffee, riding, Tally. Bookmark the permalink.